5KG two-way Flywheel. Robust frame provides stability and durability. ROHS CE compliance. Warranty (Home Use) is 12 Months. Maximum User Weight is 100KG. The recumbent magnetic exercise bike is ideal for those looking for more comfort whilst they work out at home. 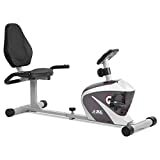 It is the perfect exercise bike for those with lower back or neck pains as there is no bending involved, you can literally sit back and start pedalling. Cycling in this manner also helps your body alignment and reduces the risk of fatigue and in turn increases the ability and desire to continue with your work out. With a recumbent bike you are sat into the frame with your seat in line with the pedals creating a lower centre of gravity making the rider and the bike extremely stable. The recumbent bike will feel like a touch of luxury compared to an upright bike as it comes with a padded back rest and seat for your comfort. It is also designed so that the contoured padded handlebars have inbuilt heart rate sensors that are connected to the monitor. This exercise bike is easy to use, sturdy and durable. You can alter the resistance simply by turning the knob on the frame keeping yourself challenged at all times. Due to the design of this bike it is ideal for a variety of users from the young to the elderly. Exercise has never felt more comfortable. User Weight: Maximum user weight: 100kg. Posts related to JLL RE100 Recumbent Home Exercise Bike. 5kg two way flywheel with 8 levels of magnetic resistance. 6 - Levels of seat adjustment, Monitor displays speed, distance, time, calories and pulse. 12- months warranty.